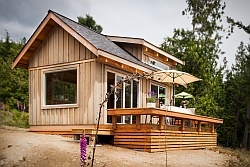 The Mini-B is a small prototype dwelling intended to demonstrate that building to the Passive House standard is achievable and affordable in the U.S. Pacific Northwest, and will result in comfortable, energy efficient homes. 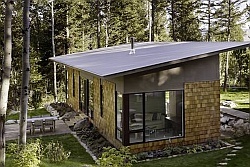 A Passive House combines high-level comfort with very low energy consumption. Passive components like thermal windows, insulation and heat recovery are the key elements. A passive house doesn’t need to be heated actively, because it essentially uses passive heat gains to heat itself. The heat stays inside. Passive heat refers to passive solar heat gain as well as the heat given off by occupants and appliances. 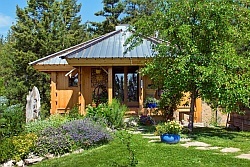 The Mini-B achieves the Passive House standard by, among other things, using high-performance windows, eliminating air leaks in the building envelope, heating water with a solar collector, and using a heat recovery ventilation system to bring in fresh air while recovering heat from the exhaust air. The Mini-B also has a very high level of insulation. There is 3.5″ of fiberglass in the walls and then the whole structure is wrapped in 9″ of EPS foam. 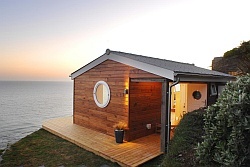 The Mini-B is a studio dwelling with a loft for sleeping. 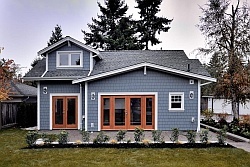 Architect Joseph Giampietro designed the Mini-B to meet the City of Seattle requirements for a detached accessory dwelling unit, a small dwelling built in the backyard of an existing house. Although only roughly 300 ft2 (29 m2), the high ceilings make it feel larger. The kitchen is compact but functional with a two-burner stove, a microwave and an under-counter fridge. The Mini-B shown here was built by students of the Seattle Central Community College Wood Construction Center under the guidance of instructor Frank Mestemacher. 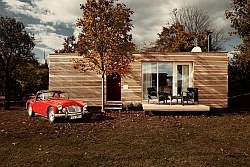 Photographs courtesy of Mini-B Passive House. Very nice design, now all we need is to remove the wood and replace it with extra thermal mass. Is the wood necessary …surely this design could achieve a sound engineered structure with a concrete/fibreglass 5 mm coating ?? ?